PASSOVER begins on April 6, 2012 – a time of Celebration! Exodus from Egypt after 400 years of slavery. Perhaps the best known of the Jewish holidays, the splendid festival known as Passover has a rich and fascinating history. Passover in 2012 will start on Friday, the 06th of April and will continue for 7 days until Monday, the 14th of April. Note that in the Jewish calander, a holiday begins on the sunset of the previous day, so observing Jews will celebrate Passover on the sunset of Monday, the 18th of April. PASSOVER Has Begun …. a time of Celebration is centered here. The origin of Passover relates back to over 3,000 years ago, when Jacob, a Hebrew, came to Egypt along with his twelve sons. Canaan, the land where they dwelt was struck by a severe famine. Jacob pleaded with the Pharaoh to allow them to live in Egypt. The kindly Pharaoh granted them the permission and allowed them to live in the Land of Goshen, the eastern part of the Nile Delta in Egypt. Jacob and his sons went there and started to live in peace. One of Jacob’s sons, Joseph, even rose to acquire the post of viceroy over Egypt and the manager of Egypt’s grain stores. Many years later, Jacob and his sons died but their heirs never went back to their land. For many years, the Hebrews resided and made their living in Goshen. They dwelt there in relative harmony with the native Egyptians. But their rapidly growing population, in the eyes of the Egyptian royals, posed a threat to the empire. 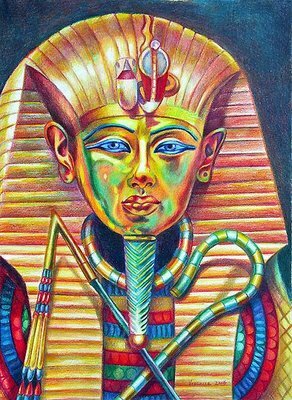 The new Pharaoh, unlike his ancestors, was harsh on the Hebrews and viewed them always with suspicion. He had forever seen them as outsiders and thought that the huge number of foreigners could join an enemy force and bring down the Egyptian empire any time. To keep them subjugated and quash their will, the Pharaoh enslaved the entire Hebrew population and forced them to build two new cities that were to be the centers of food supply for the Egyptians. Though he managed to do that alright, the population of the Hebrews could not still be kept under check. So the Pharaoh ordered his men to throw all newborn Hebrew boys into the waters of the Nile. For many days, nothing but cries and wails could be heard from Hebrew households as their infant boys were killed with unfailing regularity. The Pharaoh’s men followed his orders to the word. They raided every Hebrew home to check for any newborn male and brutally slaughtered it if they found any. One day Thermuthis, one of the Pharaoh’s daughters, saw a tiny boat floating on the river while she was bathing with her handmaidens. Curious, she ordered them to bring it to her. Her surprise knew no bounds when she found the boat to be only a small craft of bulrushes coated in pitch with a newborn baby boy inside. The princess took pity on the infant and upon the insistence of a little girl Miriam, ordered a Hebrew woman Jochebed to look after the baby. Little did she know that Jochebed was actually the mother of the infant and Miriam, his sister. The whole thing was a ploy by Jochebed to save her baby from the marauding soldiers of the Pharaoh. Some years later, the princess adopted the child and gave him the name of “Moses”, meaning “one who is drawn out” or “one who is pulled out” as the princess really brought him out of water. Little did the princess or the people of Egypt know at that time, least of all Jochebed, that the little boy was born to be the deliverer of the Hebrews. Moses ended being brought up into the Egyptian royal family, his identity unknown to them. On reaching adulthood, however, he came to know who he was really. He went to see how his brethren who were enslaved to the Egyptians were faring. Angered by the brutal treatment meted out to the people of his race, in a fit of rage, Moses killed an Egyptian slave master whom he had seen beating a Hebrew and buried his body in the sand, supposing that no one saw it or even those who knew about the incident would be disinclined to talk about it. But he soon discovered from a higher authority that the affair was known, and that Pharaoh was likely to put him to death for it. To avoid punishment, he made his escape over the Sinai Peninsula. He escaped to the desert, joined a group of shepherds, and became a shepherd himself. He married Zipporah, a shepherd woman, became a father and lived the life of a shepherd for forty years. One night, as he was leading his flock, Moses was imparted supernatural powers by God Jehovah and commanded to be a deliverer of the Hebrews. By God’s orders, Moses returned to Egypt with his elder brother Aaron and approached Pharaoh Rameses II, son of the previous Pharaoh. He delivered to the Pharaoh God’s demand that the Israelite slaves be allowed to leave Egypt for 3 days for the purpose of observing a holiday of worship and prayer in the wilderness for Jehovah, the Lord God of Israel. When the Pharaoh refused, Moses and Aaron went away to return again the following morning. They showed him a miraculous sign of warning – Aaron’s staff turned into a serpent. Pharaoh’s sorcerers, using trickery, performed the same feat, but Aaron’s serpent turned back into a staff after swallowing the staffs of the magicians (Exodus 5:1 – 5:9, 7:8 – 7:13). The Pharaoh, however, remained unimpressed. He refused to read the signs. His refusal brought to the land of Egypt the famous ten plagues, an account of which is found in the chapters 7-12 of Exodus. By God’s command and with his assistance, Moses inflicted the plagues to force the Pharaoh to release the Jews from slavery. The plagues wreaked havoc on the Egyptian households, but the Israelites were unharmed every time. The tenth and the last plague was the deadliest of them all. It resulted in the death of the firstborn of every Egyptian family, including that of the Pharaoh. As the good word was brought to them, the Hebrews made preparations to leave Egypt immediately for they feared that the Pharaoh might change his mind and stop them from leaving afterwards. In their haste, they could only take unleavened bread with them, called Matza, which is a part of celebration even today. By Moses’ order, they took along enough food and water with them and even borrowed from the Egyptians their jewels of gold, silver and raiment who obliged readily. Such was the effect of the Lord’s power on their minds that the Egyptians who had until then treated the Israelites as dirt, paid them respect now. They also feared that they might incur God’s wrath further if the Israelites had to stay back. They lent them all such things that they required for their journey and wished them a safe passage. As expected, the Pharaoh soon changed his mind, and before long, he was in pursuit of the runaways with a large army. He was determined to bring the Jews back. The Hebrews had traveled for 40 days and nights, and were just at the northern tip of the Red Sea, when they saw the emperor’s army advancing towards them. Shut in between the Pharaoh’s army and the sea, the Israelites despaired and asked for help from Moses. 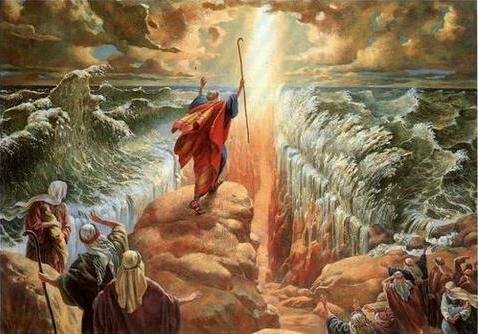 The book of Exodus records that by God’s command Moses held out his staff towards the sea. A fierce wind blew all night. At daybreak, the waters of the Red Sea stood divided with a patch of land in between so that Moses, with the Hebrews could pass safely across on dry ground. When the Egyptian army attempted to follow, God made the waters to return upon them and drown them. It is not known whether the Pharaoh mate the same fate as his soldiers for the Egyptian records do not chronicle such an event. and they still thank the Lord for saving their ancestors the way he did. In the days before Passover, the house is prepared. The house is searched for any trace of yeast products (chametz), and the whole family is involved in the search. All products made from yeast are eaten or removed from the house, or given away to Non-Jewish people. All the dishes, silverware, pots and pans are changed for a set that is used only for Passover. In remembrance of the hardships their ancestors faced in slavery, the Jewish people hold a feast called the ‘Seder’ on the first night of Passover (first two nights in Orthodox and Conservative communities outside the land of Israel), a custom that has been practiced ever since the Hebrews were free from the slavery. The word ‘Seder‘ stands for ‘order‘ and signifies the order of historical events recalled in the Passover meal as well as the meal itself. The Seder is celebrated by each participant to relive the Exodus as a personal spiritual event. The Seder is of a religious nature with a carefully prescribed ritual that makes the dinner quite unlike family dinners held on civil holidays. The ritual is laid out along with the main story of Passover being retold from the ‘Haggadah’, a special book that is followed during the Seder. The table is set with the finest china and silverware to reflect the importance of this meal. While the main story of Passover is read by Jews the world over, local customs and traditions have changed over time, so that the festival has been adapted to reflect the life and routine of individual communities. As the Exodus of the Jews from Egypt took place in the spring, Passover is always celebrated in the spring. Passover is celebrated for 8 days (7 for Reform Jews), and always begins on the 15th day of the Hebrew month of Nisan. The first day commemorates the escape of the Jews from the tenth plague while the remaining seven days mark their “liberation from slavery” and Exodus from Egypt. In Israel, Passover is celebrated for seven days, with the first and last days observed as legal holidays and as holy days respectively. All the Jews abstain from work and observe these two days with special prayer services and holiday meals. The Seder is held on the very first day. The five days in between are known as “Chol HaMoed” (meaning “festival days”). It is a time for family outings and picnic lunches of matzo, hardboiled eggs, fruits and vegetables, and Passover treats such as macaroons and homemade candies. While modern Israeli Jews observe a seven-day holiday wherever they are, Diaspora Jews observe the festival for eight days, the only exceptions being the Reform and Reconstructionst Jews. The Jews outside Israel conduct the Seder twice, on both the first and second days of Passover. The “Passover” festival is also referred to as “Chag he-Aviv” (the Spring Festival), “Chag ha-Matzoth” (the Festival of Matzahs), and “Zeman Herutenu” (the Time of Our Freedom). It is the first of the three major Jewish festivals (the other two are Shavu’ot and Sukkot) with both historical and agricultural implication. Agriculturally, it marks the beginning of the harvest season in Israel. However, little attention is paid to the agrarian aspect of the holiday. Filed Under: AFRICA, AMERICAN [U.S.A.], ASIA, CANADIAN, CELEBRATION - HOLIDAYS, CENTRAL AMERICA, EURASIA, EUROPE, FEATURED, FEATURED EVENTS, MIDDLE EAST, NORTH AMERICA, OCEANIA, SOUTH AMERICA, WORLD EVENTS Tagged With: 2012, A Celebration of Women, a time of Celebration!, Egyptians, God Jehovah, jewels of gold, jewish holidays, Moses, Passover, PASSOVER begins on April 6, Pharaoh, silver and raiment, splendid festival, the Israelites, women.